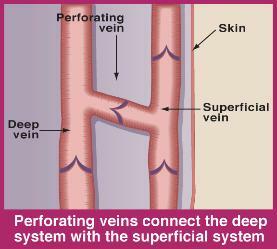 Skin ulcers may develop when the valves of perforating veins fail, resulting in extremely high venous pressures close to the skin. 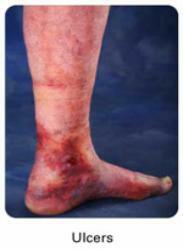 This causes decreased local blood supply to the skin, resulting in skin breakdown and a non-healing ulcer. These ulcers may be treated by sclerosing (injecting the vein with a medicine to cause its collapse) or ligating the perforating vein. Often, closing the main trunk of the saphenous vein will allow ulcers to heal.